In a medium saucepan, combine the sugar & cornstarch. Slowly whisk in the milk & egg yolks. On low speed add remaining ingredients in order given but do not over-mix. This takes less than a minute. Cool in pan for 10 minutes. Remove to a cooling rack to cool (about 45 minutes). 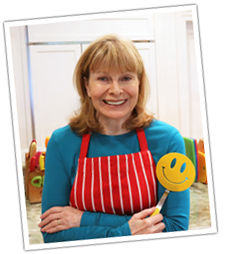 With a sharp serrated knife, slice the cake in half and carefully remove the top half. Cover the bottom half with cooled custard and place other half on top of custard. Combine glaze ingredients to a thin spreading consistency and spread on top of cake. Keep refrigerated. 11 Comments on "Boston Cream Pie"
Love this. ❤️ I made the filling the night before so it was easy the next day, and super delish!! Thank you Jenny. 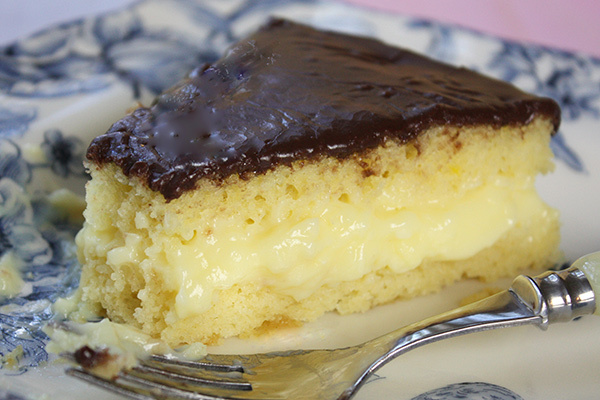 Forgot to tell you my Mom always made Boston Cream Pie on a Saturday or for Sunday dinners. Going to try your recipe tomorrow!! I had a rough last year. I lost my husband in 12/16 & then my Mom in 5/17. VERY bland. Hubby and I shared a piece then threw remainder in garbage. I don’t usually comment on recipes but was a waste of time and ingredients. OMG! When I discovered the “easy yellow cake ” recipe was the same (except for sugar opt.) as the cake in this Boston Cream Pie. I let out a” hoot” and began making the custard. It is wonderful! I know it will be a hit with the family. I went all the way with this yellow cake. 🙂 Thank you Jenny. Made this cake today. For the amount of effort, the cake is very mediocre. Not much flavor at all in the cake or custard filling. If you don’t like sweet desserts, this might be for you. The icing though is almost too sweet and very vanilla flavored for the very bland cake, It’s a very pretty cake though, and perhaps more healthy for you without the butter and using olive oil. I have made this cake twice. The first time I made it without the cake strip, and it was too round on the top. The glaze went down the sides. I decided to purchase the cake strip, and the cake had a nice flat top. The cake looked like professional made it. I want to add that it does not matter what it looks like, because the cake is delicious and easy to make. It will be a part of our family Sunday dinner for a long time. Thanks for the extra tips on cooking! Keep posting your delicious recipes. Looks yummy! I am thinking of adding 1 teaspoon of vanilla extract to the pastry cream. I am not sure if it will make the cream too runny. Thank you. Love this recipe ,it was easy and delicious. I will definitely make this one over and over.